Among St Luke’s fantastic volunteers there’s a special person who’s packed an impressive amount into her young life and is a great inspiration to all around her, whatever their age! 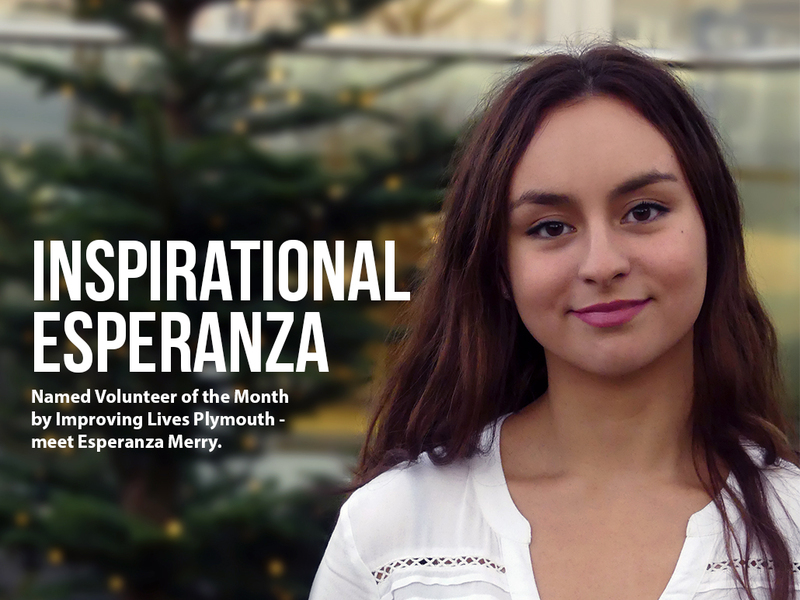 A familiar face at the specialist unit at Turnchapel, where she gives her time to help on reception and serve in the Driftwood Cafe, 17-year-old Esperanza Merry was recently named Volunteer of the Month by Improving Lives Plymouth. 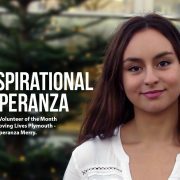 Meeting Espi, as she likes to be known, it’s easy to see why – her enthusiasm for giving back to St Luke’s, which cared for her grandfather at the end of his life, bubbles over. Espi is not a ‘typical teenager’. By the age of 11 she had competed in – and won – over 40 tennis tournaments worldwide. However, in 2011 a life-threatening infection in her hip led to septic arthritis and not only did this impact her professional tennis career, she was expected to be in wheelchair for the rest of her life. With the help of surgery, physiotherapy and her own grit and determination though, she gradually progressed to walking on crutches and then completely unsupported, although she still has to deal with constant pain. Inspirational Espi made her mark along the way, becoming the world junior champion in wheelchair tennis. Although it was a huge part of her life, she has since retired from the sport to follow other interests. As part of this, she is studying business at City College. Listening to Espi, it’s clear she is very happy to juggle her studies and volunteering. It’s also obvious that this is someone who relishes a challenge! 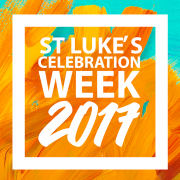 If Espi has inspired you to volunteer with St Luke’s – or to speak with friends or family about volunteering – the new year could be a great time to start! Our special nurses are central to the care St Luke’s provides 24 hours a day, seven days a week, including over the Christmas period. But how does it feel to be providing such essential care at this time of year, and how does Christmas impact their patients and families? Karen Thorrington is part of the team at our specialist unit at Turnchapel, where we have 12 beds for patients with with complex needs that are proving difficult to manage in other settings. Karen said: “It’s an extremely special time of year, especially for our patients as for many it will be their last. We try to create as many happy memories as possible as it’s important they get to experience everything they can with the time they have left. We make sure there’s a really jolly atmosphere on the unit. It is bittersweet, but us being happy at work helps our patients and their families. There’s definitely more laughter than tears. We remain sensitive to everyone’s needs, decorating the unit towards the middle of December as too early can be a reminder for many that they may not see Christmas. Around that time, staff can be spotted with tinsel in their hair, wearing Christmas-themed tights – often a talking point! The best way to describe what we do at Christmas is to give people the gift of time – time to open presents, time for a meal together, time for sharing stories and laughter. There’s nothing more important than time for those who are spending their last days with us. Sometimes we have to make the decision to bring Christmas forward as we did for a patient and her family last year. The catering team provided a fantastic buffet, including special treats for the patient’s grandchildren. James Mills is part of the St Luke’s team based at Derriford Hospital. The team offers specialist advice and support for any hospital inpatient with a progressive life limiting illness. 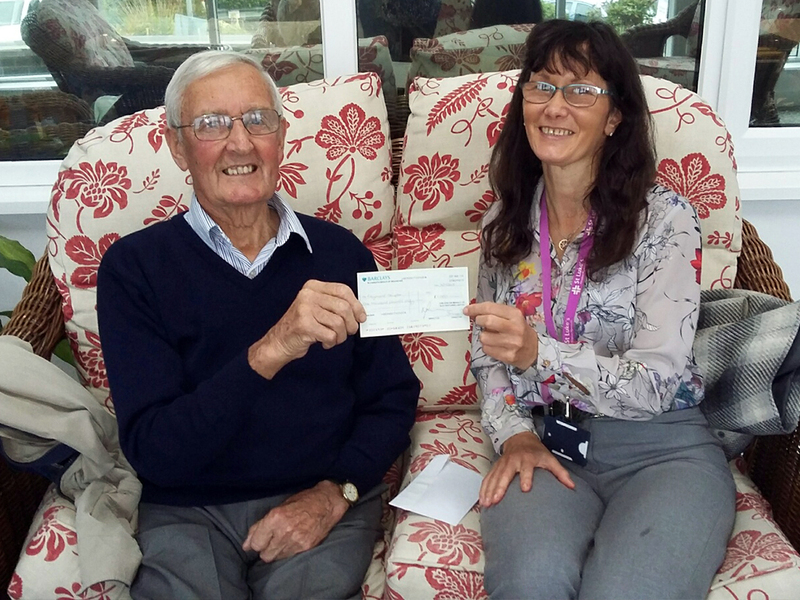 James said: “We provide a palliative care service to the whole hospital seven days a week, including over the Christmas period. We work closely with staff and patients on Brent ward (oncology), who are very good at creating a positive and festive atmosphere. Christmas can be an emotionally charged time for people, and of course this is even more true for patients and families faced with a life limiting illness. There’s an awareness that this might be their last Christmas together. A nurse in our team spoke recently of a patient signing Christmas cards now so her family have one to open from her this year. We also see patients and families bringing their Christmas forward in order to be able to celebrate with loved ones. Jenny Evans works with our Crisis Team, which provides terminally ill patients with a 72-hour window of specialist care at home, including those in residential and nursing homes, at a time of crisis. 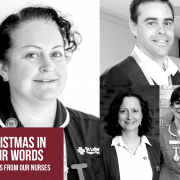 Jenny said: “Working over the Christmas in healthcare feels different to most other professions, as we often miss out on our own family celebrations, which can be sad. This doesn’t compare to the feelings our patients and families are experiencing though. 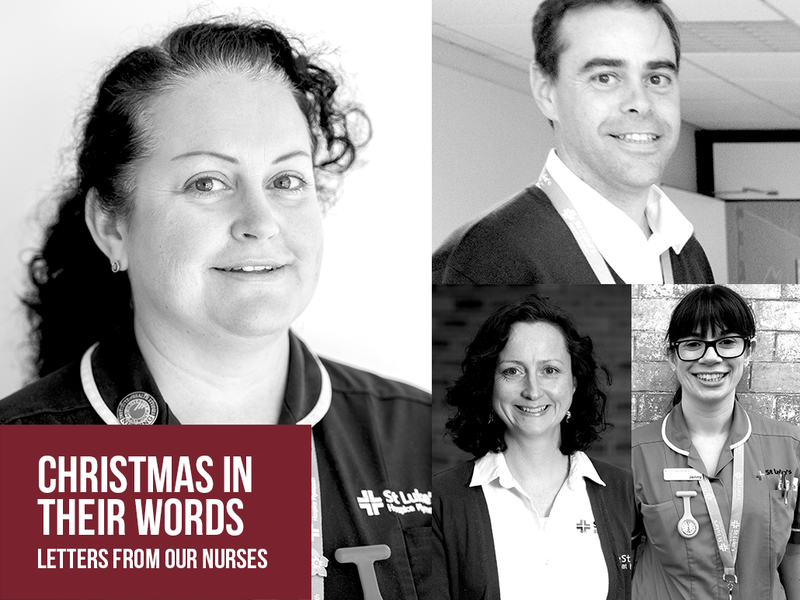 It’s a great privilege to be involved in a patient’s care, particularly at this time of year. While we can’t change the fact that the person is dying, we can help make it as dignified and comfortable as possible, providing holistic care, as we do all year around. A particular memory that stands out is from 2005, when I spent Christmas Eve helping facilitate a discharge home from hospital. The man was in his early 40s, with children. He was in the last days of life and both he and his family were desperate he should get home. 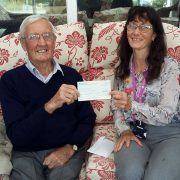 Julie Hicks works as part of the St Luke’s at home team, which offers specialist advice, care and support to people with progressive life limiting illnesses in the comfort of their own home. Julie said: “When someone needs our care at home, it is understandably a difficult time for both them and their loved ones, regardless of the time of year. I’ve noticed though, that in the run-up to Christmas they can be experiencing the strain of extra concerns. Christmas is a special time of celebration, but for some people with life limiting conditions and their families, it can be a time of reflection and great sadness.